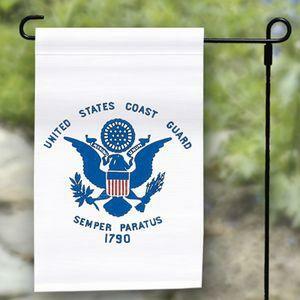 High quality outdoor nylon Coast Guard garden flag. The Coast Guard Garden Flag has a sleeved top that will slide on the popular garden style flagpoles. Our U.S. Coast Guard flags are fully dyed for great outdoor performance. All our Coast Guard Flags are proudly made in the USA. --- Featuring a white background with the Great Seal of the United States, the U.S. Coast Guard flag reads "United States Coast Guard", and above are the words "Semper Paratus"--Always Ready. It also incorporates the date, 1790, which is in fact the year that the predecessor of the Coast Guard, the Revenue Cutter Service, was founded. The Coast Guard was officially formed in 1915 when the Revenue Cutter Service merged with the US Life Saving Service.